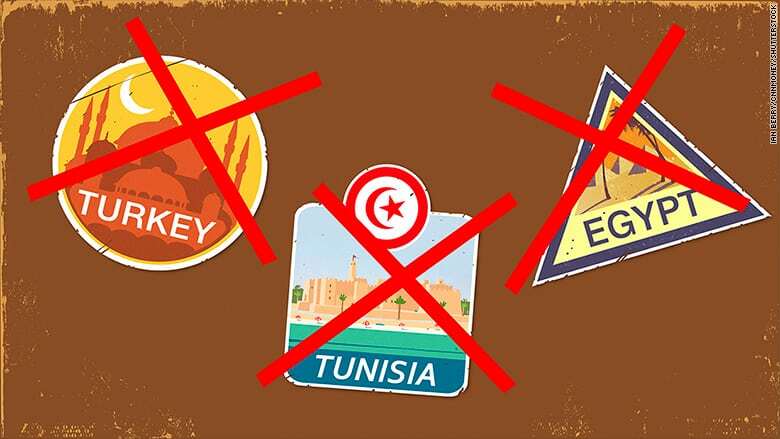 This is very good news for the travel and tourism industry in Turkey, Tunisia, and Egypt, although the two Arab countries have yet to recover their full potential. Turkey with the biggest market share of the three, is showing a 66.4% growth in UK leisure bookings on last year; Egypt is ahead 50.9%, and Tunisia – with a 0.7% share – is ahead 901.0%. eisure bookings to more traditional safe destinations, Spain and Portugal have fallen back 2.5% and 0.2% respectively, according to the combined ForwardKeys and GfK data, although their visitor numbers have been kept high in recent years as a result of the threats to other destinations. The findings reveal the true impact that terrorism had on Middle Eastern and North African destinations in the last few years, including Morocco, and show that recovery has only recently begun. In terms of scheduled capacity, Egypt and Tunisia both have a long way to go to reach their 2015 levels. In the third quarter of this year, Egypt has 46% of seats available three years ago, and Tunisia, 38%. However, Turkey’s recovery is progressing much better. Seats on direct flights from the UK are back to 94% of what they were in 2015. The latest ForwardKeys and GfK research – carried out for a joint presentation with HSBC Global Research – shows that overall UK leisure travel is ahead 4.9% this summer. Older PostNot clear: State of Emergency in Hawaii County?